Gator Bites, Issue #010--Viva Cape Coral! 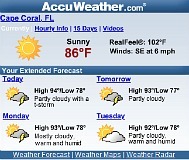 The weather's really heating up. Temperatures are hitting 93-94 degrees, but it doesn't get much hotter than that here, and there are those cooling Gulf breezes. Hurricane season starts now and lasts until November, find out more about hurricanes and how to prepare for them. In May, we went to several restaurants and ice cream shops. We also went to Viva Cape Coral, a celebration of Latino culture. Don't forget to click on the links below to see new pages, more photos, videos, and information. Cape Coral used to have a Cinco de Mayo festival at the beginning of May, but this year they decided to have a festival that celebrates cultures from the Caribbean, and Central and South American countries. Viva Cape Coral is a great way to experience the food, music, crafts, and dancing from Colombia, Mexico, Puerto Rico, Nicaragua, Jamaica, Cuba, and more. It was a lot of fun for me to go, I was fortunate to live in Panama and Brazil when I was a kid, and I enjoy these different cultures. 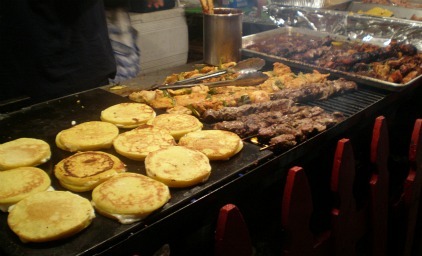 I especially loved getting grilled meat on a stick when we go to the ruins of old Panama ....... mmmmmmmm ........ delicious! 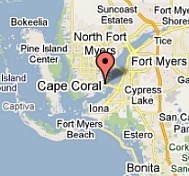 See more pix and find out more about Viva Cape Coral. Looking for a really nice restaurant on the water for a special occasion? Then you've got to go to Rumrunners, at Cape Harbour in Cape Coral. The food is awesome, the views are terrific, and the atmosphere is delightful and relaxing. Go by boat or by car, just get to Rumrunners. Also at Cape Harbour, is my favorite ice cream place, Run Agrounds. They are a coffee shop that has specialty drinks, pastries, bagels, quiche, and gelato! What is gelato? It's an Italian ice cream that is smooth and creamy, yet light and refreshing. I'm just crazy about their mango, coconut, cinnamon, raspberry, and lemon gelatos. 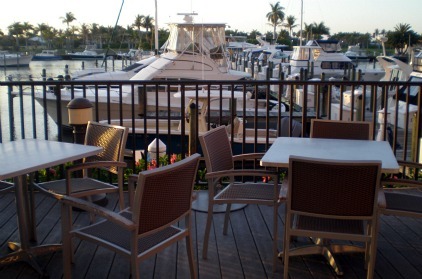 Sit outside and enjoy the views of the marina. Go to Run Agrounds and you'll want to get their Ice Cream Savings Coupon, because I think you'll be going there a lot! The other ice cream shop we went to is the Ice Cream Club. They have about a gazillion flavors, soft serve, frozen yogurt, cakes, and toppings. They have a 10% off savings card, free birthday cone, and two locations. The best part is that we can walk to one of their locations,Ice Cream Club, get yourself over there! The young lady in the picture above is my daughter, Nicole, and she is quite the photographer. She has her own website, NikkiB, where she sells her photos on prints, note cards, mugs, mousepads, tee shirts, puzzles, and more. 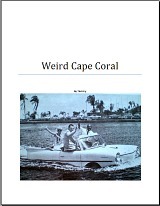 She has a gallery for Cape Coral photos, and also one for Pine Island and Matlacha. They make perfect gifts or souvenirs, if you are looking for something special. Check out her pix at Cape Coral Photos. Another restaurant that we went to was Geos, a terrific Italian restaurant that I love to go to for their Spaghetti Carbonara. We also went back to Pizza Baker and tried their Philly Cheese Steak pizza and sub. UPDATE MAY 2012: Pizza Baker is out of business. I put up a page about our neighborhood pizza joint, Brickhouse Pizza, have you ever had Chicken Alfredo Pizza? Its my favorite at Brickhouse, you've got to go there and try it! 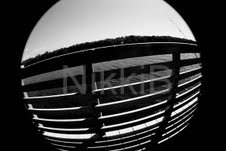 For the Pic 'O the Month, I have another of Nicole's photos, I absolutely love it. It's of my other daughter, Sophie, laying out on our lanai.